Dr George has had twenty years' experience working exclusively in the treatment of sports, exercise and musculoskeletal injuries. 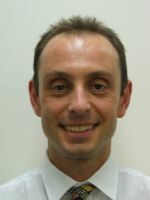 He has a background in general practice and during his sports medicine training has spent time with the College of Sports physicians, has treated elite athletes at AFL clubs Geelong and Melbourne and gained knowledge in orthopaedics through assisting upper and lower limb orthopaedic surgeons. He has experience treating a wide variety of both upper and lower limb conditions, in both adult and paediatric patients. These injuries arise in the context of Australian Rules, netball, basketball, running and a wide variety of other sports but he also has experience treating people who suffer injuries during everyday activities. Personal sporting interests include running, cycling and swimming.